Star Wars.com have launched the official key art and poster for Star Wars Celebration Europe 2016, the poster features the heroes and villains of Star Wars: The Force Awakens and Rogue One: A Star Wars Story. As you can see from the image above, the art features the cast of The Force Awakens looking stoic, along with a beautiful rendering of the characters of Rogue One. Alongside the Rogue One cast are a squadron of death troopers — the black-armored stormtroopers seen in the film’s trailer — and the first clear look at the brand new Shoretrooper on the bottom left. Also on the poster is a new class of AT-AT: the AT-ACT, or All Terrain Armored Cargo Transport. The key art will be featured on merchandise throughout Celebration, and available to purchase as a poster at Star Wars Celebration Europe which will be held on July 15-17 in London, England, at the ExCel, featuring three full days of entertainment, celebrity appearances, interactive events, sneak peeks, and more from everyone’s favorite galaxy far, far away. You’ve seen the movie, now read the comic book. Marvel has just revealed the initial cover and variants for its upcoming adaptation of Star Wars: The Force Awakens. The first installment in the five-issue series, written by Chuck Wendig (author of Star Wars: Aftermath) and illustrated by Luke Ross, will arrive in stores and digital services on June 22. The comic art and variants put a new, graphical spin on the familiar movie images. Marvel has done a cranking job on the various Star Wars titles (most of which I now own) since re-acquiring the license from Disney cohort Lucasfilm. 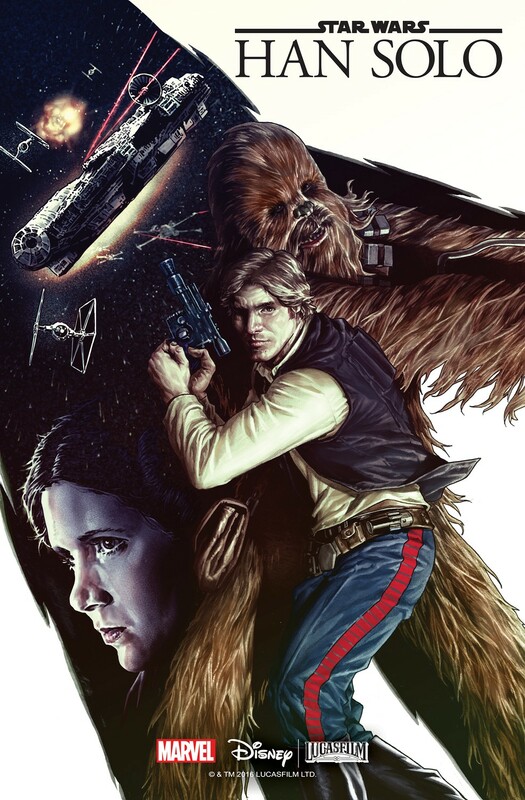 In addition to The Force Awakens, the publisher will roll out the limited-edition Han Solo series next month. I’ve debated this with people all week, as I originally wasn’t going to post this article, as it seemed quite a ‘MASSIVE’ spoiler for Rogue One, but it’s 2016 and one can safely say it’s already all over the Internet and Social Media, so if big companies like Twitter and Google isn’t taking this imagery down I’d say it’s fair game to publish this little article on my meager blog…HEY!! It’s not our fault that these big multi-national companies keep getting caught flat-footed when eager fans use the Internet to find things that publishing corporations want to keep hidden. So if you put illustrated pages from the upcoming Rogue One: A Star Wars Story on your publicly accessible servers nearly 8 months before it’s release and expect no one to find them. TUT TUT!! Wags his finger in utter disgust. YOU’VE BEEN WARNED, although Disney is now claiming the following information is not completely accurate, but here goes…This week German Star Wars fansite Jedi-Bibliothek made a random discovery on Edelweiss, which is an online search tool where publishers can pay to have their upcoming books listed for anyone to find, had put out their winter catalog online, and this time someone put a book on the list that may have ruined a carefully cultivated mystery box. The book in question which they stumbled across was Rogue One: A Star Wars Story: The Official Visual Story Guide with a massive collection of draft (Hi-Res) page spreads. So you remember, Luke Skywalker was omitted from Star Wars: The Force Awakens promotional images, and he had a brief appearance in the film. His role was a closely guarded secret, unveiled at the very end of the film. But here that mystery box is blown wide open as we see Darth Vader getting his own centerfold…this wouldn’t have happened on JJ’s watch!!! But the Rogue One spoilers don’t end there. Included in the leaked pages are a brief breakdowns of the characters featured on both sides of the conflict in Rogue One. Diego Luna’s so-far unnamed character is Captain Cassian Andor, (not Biggs Darklighter…darn) described as a Rebel Alliance Officer. Jiang Wen, seen in the Star Wars: Rogue One trailer sprinting toward a massive AT-AT, plays a character described as a “freelance assassin.” Riz Ahmed plays Bodhi, a rebel soldier, and Donnie Yen, who displays formidable hand-to-hand combat skills in the Rogue One trailer, plays a character named Chirrut, described as a “spiritual warrior.” There are also two alien characters named in the promo material, Pao and Bistan, but they haven’t shown up previously in casting materials. both are listed as ‘fierce warriors’ who alongside Jyn Erso played by Felicity Jones will lead these cohorts in this rogue band of resistance fighters, who are prepared to steal the Death Star Plans and bring new hope to the galaxy. United in this daring mission, the heroes in this Rebel Alliance will have to enter battle against the evil forces of the Empire. Two other major spoilers are confirmed in the leaked images from the Star Wars: Rogue One Visual Guide. First up, Ben Mendelssohn’s character is named Director Krennic, and he reportedly serves as a military director. Lastly, the black-armored Stormtroopers at his back are confirmed to be Death Troopers, deadly special forces soldiers in service to the Empire. Additionally, the leaked images from the Star Wars: Rogue One tie-in guide feature detailed schematic-type images of a NEW Rebel starfighter called the U-Wing and a new TIE fighter called the TIE Striker, both spreads breaking down their capabilities and the roles they play in their respective fleets. The one below is great spread, which the first paragraph starts with “THE WHITE GLEAM of a stormtrooper’s uniform. Darth Vader’s iconic semi-samurai helmet and mask. Leia’s bikini, shimmering gold above the Sarlacc pit. The Star Wars Universe is jam-packed with memorable characters, all of them decked out in a wondrous wardrobe. So when it came time to find a costume designer for The Force Awakens, the film’s producers knew they’d need someone who could create lasting looks that both drew from the past and informed the future of the franchise. To meet this challenge, they turned to veteran costume designer Michael Kaplan.” It then goes on to describe this new AT-AT variant called the AT-ACT “Standing over 20 meters tall with blast-impervious armor plating, these massive constructs are used as much for psychological effect as they are for tactical advantage. Their menacing presence can strike fear into the hearts of any enemy forces who dare try to topple the terrorizing technology. Still, many try to do just that. AT-ACT (All Terrain Amoured Cargo Transport) walkers were among the fastest Imperial vehicles of their type, designed primarily for patrols and scouting missions. When the Empire wanted more land on the Outer Rim planet of Lothal, AT-ACTs were used to quickly clear out farmers from their property. While not as imposing as its larger AT-AT walker cousin, the AT-ST nonetheless served as a significant addition to the Imperial side of battlefields in the Galactic Civil War. The two-man craft is lightly armed with chin-mounted laser cannons, and side-mounted weapon pods. The two-legged transport, dubbed the scout walker by many, serves as a reconnaissance and patrol vehicle, often flanking approaching AT-ATs and mopping up infantry that sneaks past the larger walkers. The Imperials used AT­-STs in both the Battle of Hoth and the Battle of Endor. We also get a look at the new Imperial Assault Attack Tank seen in the trailer, could it be called the …IA-AT? The book is set to be produced by Media Lab Books and to go on sale on January 24th, 2017 (over a month after the film’s release), The Official Visual Guide will be 164 pages in length. 130 of those will be full-color. UPDATE : Although these preview images have turned out to be an unintentional leak, Disney is starting to ask sites to remove the images, so it won’t be long before this article or imagery is removed, as the leaked information contained on the draft page spreads were not final, So as I said at the beginning, Disney is claiming the information is not completely accurate… Enjoy it while you can. It seems the title may have leaked for Lucasfilm’s Star Wars: Episode VIII. An image has found its way onto web, the photo reveals that the title of the film could be Star Wars: Fall of the Resistance, which seems quite a legit title. It’s claimed the photo was leaked from a member of Star Wars Celebration. An image like this could be faked, as I’ve quite easily replicated below …so for now we will consider it a rumor until Lucasfilm makes an official announcement.